Tin Mine. In very bright conditions the ND Filter helps control exposure. Top: Unable to wait for better light the shot was washed out and too bright. 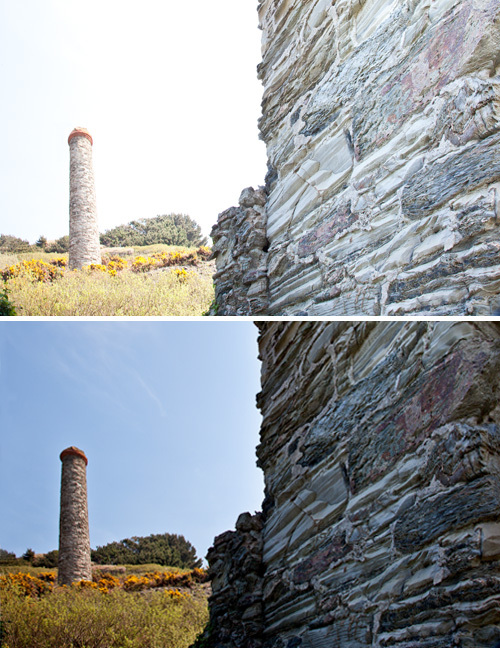 Bottom: Seconds later, an ND filter restors the colour, pulling back details. No serious landscaper would be without their set of NDs and ND grads (neutral density and graduated neutral density filters). Sometimes you just cannot do an adequate job without them. After seeing this video I feel better about buying the right tool for the job. A Neutral Density Filter (shortened to ND filter) reduces the light intensity without affecting the colour or hue of the light that passes through it. The filter affects all wavelengths of light equally so there is no colour cast or odd light variations. Blurring the motion of water (e.g. waterfalls and rapids). Shallow Depth of Field in bright light (wide aperture would normally over-expose). Make fast moving objects invisible. Add motion blur to moving things in your shot. Extend your exposures to capture more detail. With a long shutter opening you can create wonderfully milky shots of moving water. This Google page shows a gallery of shots using ND filters. Although it takes a little practice, here is how you do it. Instead of reducing the aperture to lower the light in your camera use an ND filter. This allows you to set the shutter speed appropriately for the motion blur. Of course you will have to do this in manual. Also, you will have to try out a few shots to get the shutter timing right. The camera light meter will be miss-leading behind the filter and because the light conditions will be variable. After a little practice you will find it is easy. You will notice that the ND picture above looks rich and well exposed despite the bright sunlight. Tripod mounted shots of flowers in bright sunlight are easy because you can prevent the colours washing out and have a wide open aperture. This allows you to have a shallow depth of field so the flower is thrown into sharp focus and the background is out of focus. Slow moving things can be blurred by using an ND filter. Just take a shot using the ND filter and the slow moving object will develop motion blur. You can do this in low light with the hands on a clock. Fast moving objects tend to disappear in long exposures. Take a picture of a building from across the road and passing cars will normally ruin your shot. If you use an ND filter and set up a very long shutter opening one or two cars the cars will not bother you or ruin your shot. If you are doing a 30 second exposure two cars, total 0.5sec in front of the camera will not be there long enough to show up. If you set your aperture to a really high f-number, say f22, and take a landscape shot with an ND filter, you will be able to control the light and at the same time the sharpness. the long exposure will ensure that you can put your ISO on a low setting and get a high quality result. Taking a shot this way will allow you to get detail in your shot right through to infinity. Finally, if you use an ND filter to take a shot of the moon you can do around a 15 to 20 second exposure without the moonlight blowing out the picture and just appearing as a round bright disc. The ND filter cuts down the light and helps the detail to come out. ND filters also come in two sorts – full filter and graduated. So far I have mostly talked of the full filter. The filtration is applied uniformly across the filter. However with a graduated ND filter (or ND Grad.) the filtration is taken only half way across. This can then be applied to the sky above the horizon to bring down the brightness of the sky. At the same time the un-filtered half allows all the light through so the land beneath the sky remains un-dimmed. This helps create an even balance of light across the shot. ND grads are used a lot by landscape photographers who would rather get the shot right in camera than spend hours in photoshop. ND filters come in a variety of strengths. The ND2 halves the light allowed through. The ND4 lets only 25% of the light through. An ND8 allows only 12.5% of the light through. In fact every succeeding strength halves the light of the proceeding strength. You can buy ND filters that let in less than 100th of the light through. In most cases amateur photographers find an ND8 is the strongest they will need for most ordinary purposes. Again, a little practice is required to see which strength is most useful for different light levels and shots. The best way to learn to use the ND filter is to get out there and try one. Slide-in filters go into a front mounting frame on the end of your lens. A fitting kit with adapters allows you to fit the kit to a range of different sized lenses. Make sure you buy the right one fitting kit for your camera. The other type of filter are dedicated round ones that screw into the thread on the front of your lens. You can buy adapter rings for these too. In general people buy the one for their lens and only use it on that lens. Screw on ones have limited use compared to the box loaded ones. Since they fit only one lens size they tend to be restricted to one lens unless all your lenses are one fitting size. This entry was posted in Equipment, Light and Lighting, Things to try, Video included and tagged Filters, Lens, Light, Video. Bookmark the permalink.